Washing machines have changed a lot over the years. Whereas once a typical washing machine was a top-loading, belt-driven design with mechanical timer controls, more recent machines include technology like direct-drive, fully electronic controls and plenty of wiring. And those aspects make any washing machine built in the last 10 years worthy of salvaging for its internal parts. For this story we pulled apart two front-loaders, but in the past we’ve also disassembled plenty of top-loaders. All washing machines have a powerful electric motor inside. Most machines are belt-driven; that is, they use an electric motor that’s easily removed and can then be used as a standalone motor to drive anything you want – from a belt sander to a fan. 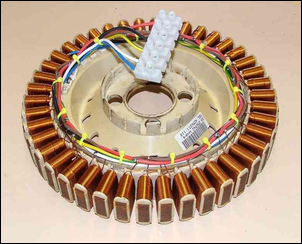 However, with the very low price of electric motors, this type of electric motor may or may not be worth salvaging. If grabbing the motor, don’t forget to also get the starting capacitor, if fitted. 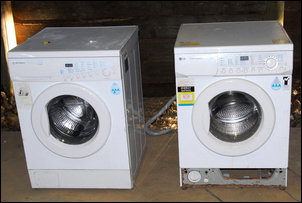 Some washing machines – notably Fisher and Paykel designs – use a very special, large diameter, direct drive motor. These can be removed, complete with the stainless steel shaft and bearings, and then used as a wind generator, water generator or even brushless DC motor. 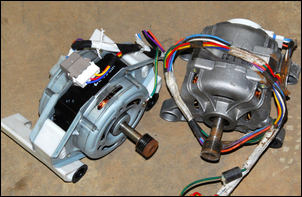 Doing a web search under “Fisher and Paykel motor generator” will find sites that describe how these motors can be easily modified (as shown here) to achieve excellent outcomes. And, if you don’t want to keep the motor, they can normally be sold online. 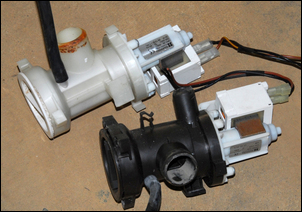 The electric pump from a washing machine is usually quiet, relatively low power (eg 30 or 40 watts), can handle hot water, and has a removable lint filter. These characteristics make them excellent for circulating water in a solar water heater or for low pressure water transfer. 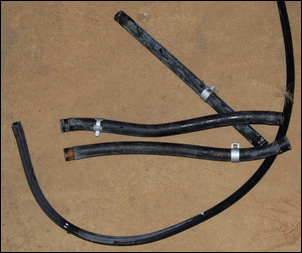 Always ensure that the wiring is appropriately insulated and water cannot come in contact with it. 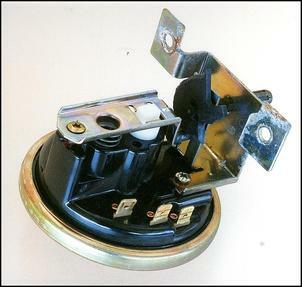 There are two – and sometimes three – solenoids in each washing machine. The solenoids are electrically operated valves that control water flow. 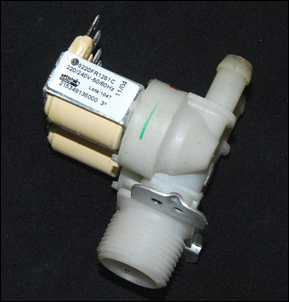 Most washing machines use 240V (ie mains power) solenoids, while some (eg Fisher and Paykel) use 12V solenoids. The lower voltage solenoids can be easily and safely used to control water flow in a variety of applications, including solar water heating systems, gardening, recreational vehicles or turbo boost-powered water injection / intercooler spray systems. They will cope with high water pressures and are usually leak-proof. Older washing machines use a mechanical pressure switch to detect water level. 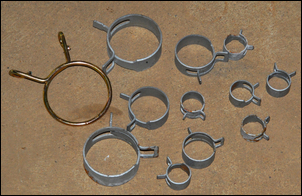 The adjustment in water level is achieved by altering the spring preload. These switches are simple to use, very sensitive and are always worth salvaging. See Zero Cost Pressure Switches for more on these. More modern machines use a variable output electronic design sensor. That sounds good, but most of these sensors appear to use an iron core moving within encapsulated electronics – and I haven’t found a simple and effective way to interface with them. Many washing machines incorporate heater elements to make the water hotter than can be provided by the domestic water heater. These machines use a temperature sensor to monitor the action of the heating element. These sensors are excellent, being of stainless steel construction and reacting quite quickly. They use a NTC design, where the resistance falls as temperature rises. As such, they are suitable for temp sensing in a range of applications. 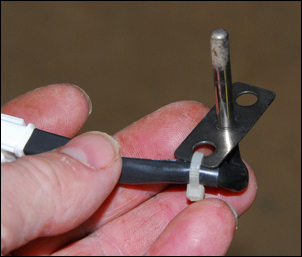 Note that the discolouring shown on the end of this sensor was just soap scum – it wiped straight off. 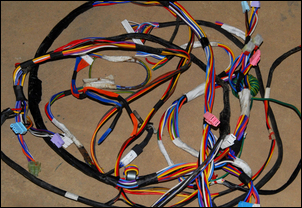 Most electronics in washing machines is ‘potted’ – that is, the boards are covered with a thick layer of rubbery plastic, waterproofing them. It’s pretty well impossible to salvage components from these boards. However, the control panel is usually not potted. By placing the control panel board in a vice and aiming a heat gun at the solder side while pulling components out the other side with pliers, it’s possible to salvage parts in literally seconds. 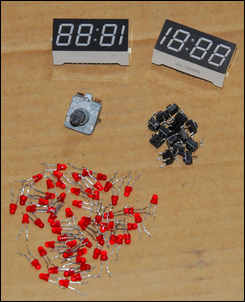 That’s what was done here – with over 50 red LEDs, two digital displays, about 15 miniature pushbuttons and a rotary encoder salvaged in just a few minutes. Quicker than going to the shop to get the LEDs! There is a surprisingly large amount of hardware in many washing machines. 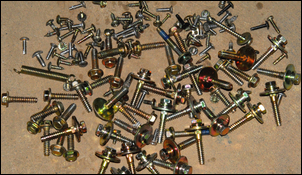 Much of it is of high quality – stainless steel self-tapping screws, heavily plated machine screws, and – in front-loaders – many long self-tapping hex-headed bolts (they hold the drum halves together). Because the washing machine tub has to cope with out-of-balance loads, most machines incorporate springing to allow lateral movement (top loaders) or vertical movement (front-loaders) of the tub. 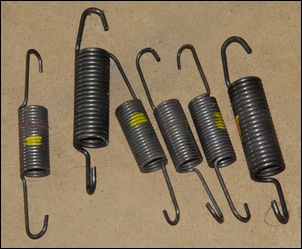 These springs are heavy duty. ...and the spring clips that hold them in place. Finally, there’s usually plenty of wiring of different gauges and colours – perfect whenever you need a short length of hook-up wire. By the time you discard the cabinet, bowl (stainless steel – so worth money at the scrap yard! ), internal weights and other bulky parts, the remaining good bits can be stored in literally a shoebox... so it’s not like the salvaged parts take up much space. But it’s even better if you sort the parts – LEDs into an appropriate drawer in the electronic parts cabinet, self-tapping bolts with your other self-tappers, and so on. Then, next time that you go looking for these components, you'll magically find that you’ve got plenty to pick from!